Two goals, a missed penalty and one goal bound shot cleared off the line. All of this from a player who had failed to score a competitive goal for 10 months. In a week when Nikica Jelavic has been heavily linked with a move away from Goodison Park he produced a fantastic striking performance to reignite the adulation of the loyal Evertonians packed inside the Old Lady. At full time Roberto Martinez gushed with praise. As always, our Spanish manager spoke eloquently about the impressive nature of Everton’s total demolition of Queens Park Rangers and he reserved specific acclaim for the overall performance of Nikica Jelavic. “It was very, very good. “He is a bit frustrated that he couldn’t get the hat-trick – I did feel his performance deserved it. “I thought he looked very sharp and that his movement was terrific in the box. “He showed that he has been working really well in training and that he has been frustrated with a lack of minutes due to the great form of Romelu Lukaku. On the basis of this 90 minutes, in the third round of the FA Cup, there is no way Everton should be even considering letting Nikica Jelavic leave and certainly not for the reported £5m valuation. Jelavic has inevitably struggled to break into the Everton team this season primarily because of the fantastic form of Belgium loanee Romelu Lukaku. But in recent weeks, the Croatian frontman has shown glimpses of returning to the blistering form that marked his arrival on Merseyside 24 months ago. When he first arrived at Everton from Glasgow Rangers, Jelavic hit 11 goals in just 16 appearances and almost unbelievably he was been compared favourably with Luis Suarez. A loss of form and apparent mismanagement from David Moyes left the Croatian striker’s confidence in tatters and the goals dried up. The end of Jelavic’s Everton career looked close when he produced a thoroughly disappointing performance away at West Ham. That match at the beginning of September was also the match in which Romelu Lukaku made his Everton debut and such was the contrast in the respective performances of the two centre forwards, it appeared unlikely that Jelavic would recover to reclaim a starting spot at Everton. The sparkling form of Lukaku has certainly not helped Jelavic’s case, but even in adversity the Croatian has, as a minimum, provided an exceptional work rate and in recent substitute appearances looked on the verge of recovering his sharpness in front of goal. And so it proved on Saturday. Jelavic could have easily left Goodison with four goals, scoring twice, hitting the crossbar with a penalty before seeing a late goal bound effort cleared off the line. However, with the transfer window open and the World Cup on the horizon, Jelavic has understandably looked for a move to secure regular first team football. But can Everton really afford to let him go. Would Everton be able to sign a player of equal quality for the proposed £5m valuation? The Blues can certainly not afford to let him go without signing a replacement, especially with Arouna Kone out injured for the entire season. Martinez faces a difficult dilemma in the next few weeks, but as in everything he has done at Everton to date I have no doubt that he will make the decision. “We’ve been very open and honest with Niki’s situation. He’s been a great servant to the club. We are six months away from a World Cup and that is a key moment for anyone’s career. We will listen to offers. It has to be right for everyone; we can’t weaken the side. i hope jelavic stays, being played out of posistion knocked his confidence for a six. let him play and im hundred per cent sure he will score us lots of goals now. he is hungry and wants to play for everton fc. So many Everton fans seem happy to let him go. Mental. 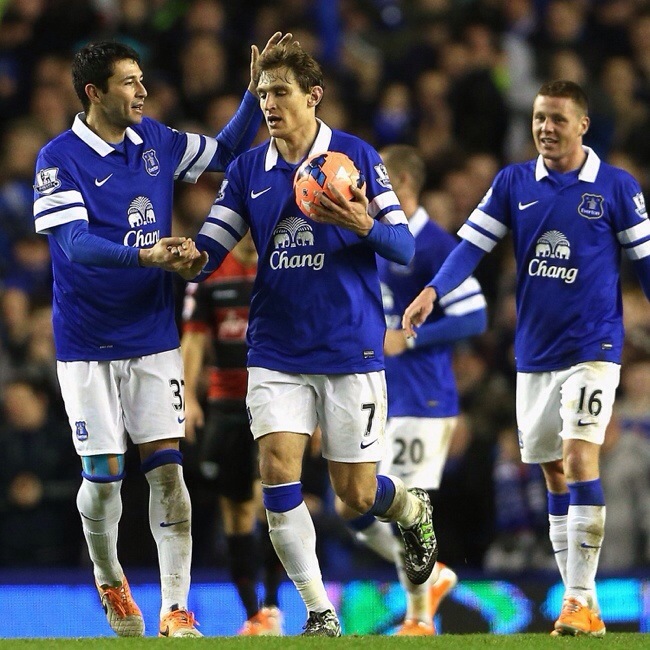 Class is permanent – he may have had a horrible 18 months, but we’re seeing signs of the old Jela returning. When he is back to full form, we’re idiots if he’s not wearing an Everton shirt at the time.